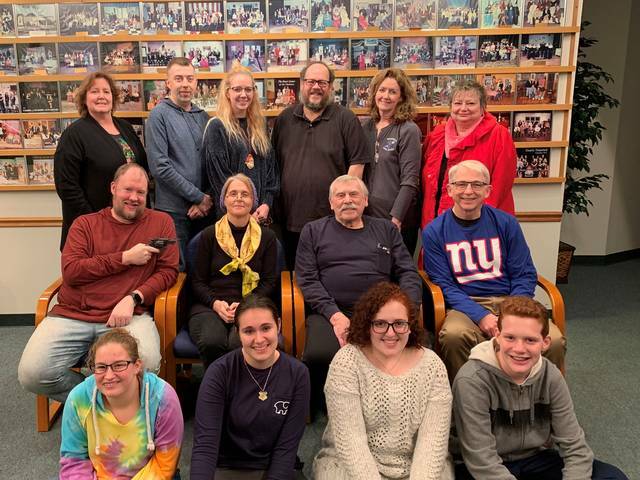 The cast of the Brookville Community Theatre production includes: Dad-Larry Lindstrom, Beth-Tori Coss, Janet-Jennifer Vance, Bunny-Jenna Vance, Bud-Tim Fitzharris, Tracy-Emma DeCan, Mrs. Draper-Kathy DeVorak, Aunt Rose-Susan Robert, Uncle Leo-Don Cordes, Tony-James Nelson, Vinny-Kendal Garret, Paul-Josh Wissinger, Emily-Emily Monnig, Mrs. Wakowski-Sheryl Koontz and Officer Hensley-John Wysong. BROOKVILLE — The Brookville Community Theatre has decided to keep Christmas alive a little longer this winter with its production of In-Laws, Outlaws and Other People (That Should Be Shot) by Steve Franco and directed by Debbi Robbins. The Douglas family is busily preparing for their annual Christmas dinner. After robbing a neighborhood liquor store, high strung and irritable Tony and his dim witted sidekick Vinny find themselves in need of a hide-out. A comic treasure that is sure to leave you in stitches while celebrating the true meaning of Christmas. The cast includes: Dad-Larry Lindstrom, Beth-Tori Coss, Janet-Jennifer Vance, Bunny-Jenna Vance, Bud-Tim Fitzharris, Tracy-Emma DeCan, Mrs. Draper-Kathy DeVorak, Aunt Rose-Susan Robert, Uncle Leo-Don Cordes, Tony-James Nelson, Vinny-Kendal Garret, Paul-Josh Wissinger, Emily-Emily Monnig, Mrs. Wakowski-Sheryl Koontz and Officer Hensley-John Wysong. The show runs Feb 21-23, Feb. 28 and March 1-2, at 8 p.m. and Feb 24 and March 3, at 3 p.m.
Tickets may be purchased by visiting the website at www.brookvillecommunitytheatre.com or by calling the Brookville Flower shop at 937-833-3531.
https://www.registerherald.com/wp-content/uploads/sites/41/2019/02/web1_inlaws-2_ne20192102012471.jpegThe cast of the Brookville Community Theatre production includes: Dad-Larry Lindstrom, Beth-Tori Coss, Janet-Jennifer Vance, Bunny-Jenna Vance, Bud-Tim Fitzharris, Tracy-Emma DeCan, Mrs. Draper-Kathy DeVorak, Aunt Rose-Susan Robert, Uncle Leo-Don Cordes, Tony-James Nelson, Vinny-Kendal Garret, Paul-Josh Wissinger, Emily-Emily Monnig, Mrs. Wakowski-Sheryl Koontz and Officer Hensley-John Wysong.